Doing something a little different today. I get such good response when I show the process of making things that I decided to make it a regular feature. 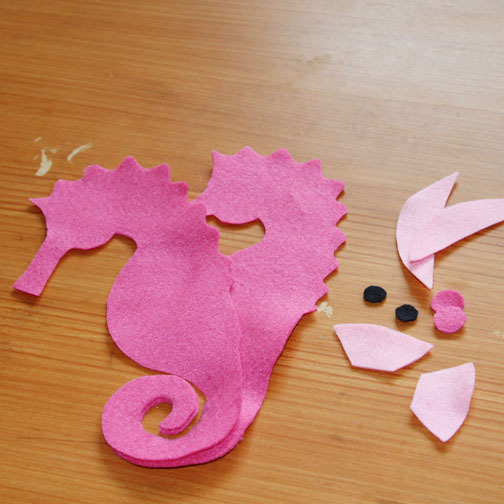 In This Series, I'm Designing A Felt Seahorse Pattern. So let's get started! 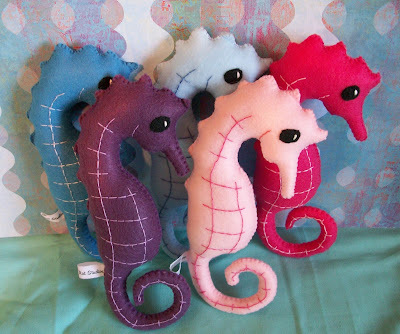 I had an old pattern for a seahorse plush I used to make and sell many years ago. The design was simple, cute and people really loved them. When I was trying to decided what pattern to make next for my shop, I thought this would be a really good basic felt pattern that anyone, including children could sew. I could have taken this pattern and said o.k. I'm done and started to write it up, but I can never leave well enough alone, so I decided to make some changes to this design, basically update it. I dug through my computer files and found my original seahorse pattern. It was for my own use so the pattern is a little crudely done. I was surprised to see that I had a back fin in this design, because at some point, I must have decided not to use it. I sat and thought about what changes to make to this pattern to make it better and more user friendly. 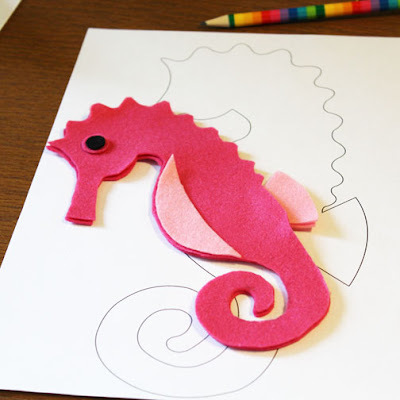 I also looked at photos of real seahorses and I looked at other felt and plush designs to see what I liked in their designs. 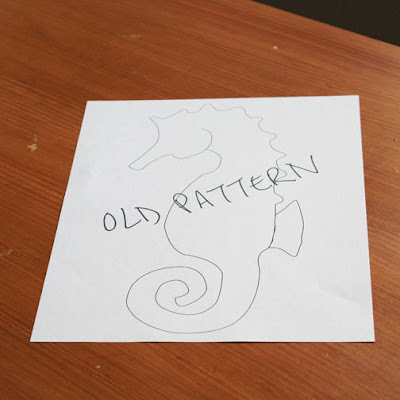 Next I printed out the original pattern and drew on it the changes I wanted to make, scanned those changes into the computer and re-drew the seahorse. I use Adobe Illustrator to draw all my patterns. I changed the snout/mouth a bit by enlarging and making it longer. I also changed the shape of the belly a bit and also the back of he tail, plus I added a fin to the seahorses back. Really tiny changes most people won't even see. One thing I did like about some of the plush designs I saw was that the back fin was a different color than the body. In order to do that it needed to be a separate piece, so back to the computer I went. I also added a belly piece to give more color and dimension to the seahorse. And here are the pieces cut out to start prototyping. 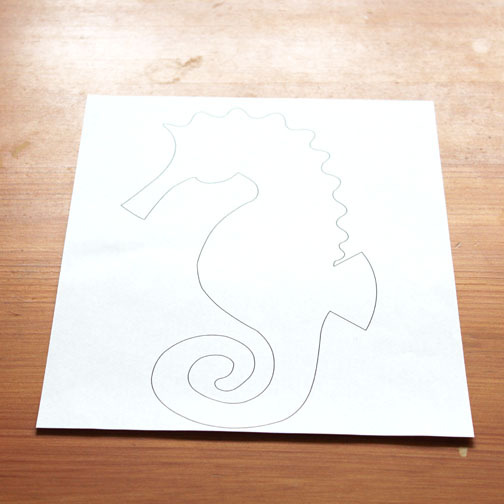 Starting To Prototype The Seahorse Design. 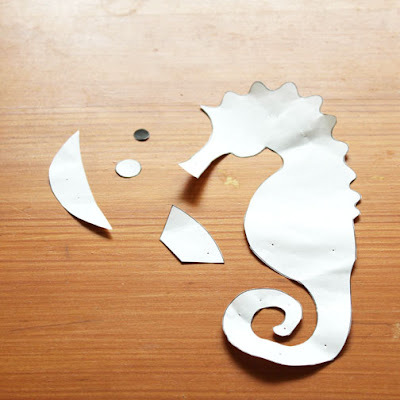 I decided to reduce the size of the seahorse pattern to make the prototype. This will allow me to make several prototypes quicker too. I'm unsure what the final size will be, as large as the original or smaller pocket size, which seems to be the trend these days. All the pieces are cut out using a really nice quality poly felt that I have drawers full of, but I can't get anymore. Love this stuff, so soft. When I shoot pics for the final pattern I'll use a wool blend felt, it's more durable and photographs better. I'm really liking this size, 25% smaller than the original, but we'll see how it goes. Come back for part 2 on the making of this felt seahorse pattern, for more behind the scenes of how it's done! PART 2 can be found here. If you want to know more about Sassy Packrat Studios, learn felt sewing tips, get special FREE access to my newest patterns, then become a subscriber member! click here to join! Thanks or the comment Bettina! I agree and think that the final pattern will probably be the larger one with instructions to scale down for those so inclined.